Elizabeth was sent away from court, as she was a reminder to Henry of Anne. Henry had remarried and was eagerly awaiting the son he hoped Jane Seymour was carrying. As it turned out, she was indeed to bear Henry a son, Edward (future Edward VI). Jane died shortly after her son was born. When it appeared that Mary had become pregnant, Elizabeth was no longer seen as a significant threat, and the aging Queen let her return to her residence at Hatfield, under semi- house arrest. Mary Tudor was nearly 40 years old when the news of her "pregnancy" came. After a few months, her belly began to swell, but no baby was ever forthcoming. Some modern historians think that she had a large ovarian cyst, and this is also what lead to her failing health and eventual death. Three days earlier, Elizabeth resided at the Tower of London and on the 14th made the procession to Westminster. Along the way were various displays and pageants for Elizabeth's entertainment. On the night of the 14th, she spent the night at the Palace of Westminster, which was just a short walking distance from the Westminster Abbey. The next day, the 15th, Elizabeth walked in procession to the Abbey for the coronation on the date chosen by Dr. John Dee, who besides being a mathematician and Greek scholar, was also an astrologer. For the procession, Elizabeth walked on a blue carpet that ran from the palace to the abbey, which was torn up by souvenir seekers after the Queen walked passed. The ceremony of the coronation was much as it had been for Elizabeth’s predecessors, but with a few significant alterations to the religious aspects of the service. The coronation mass now included readings in English and Latin for the Epistle and Gospel and she retreated to a curtained area in St. Edward’s Chapel during the elevation of the host. After the coronation, Elizabeth walked from the Abbey to Westminster Hall for the traditional coronation banquet, a custom that ended with the coronation of George IV in 1821. 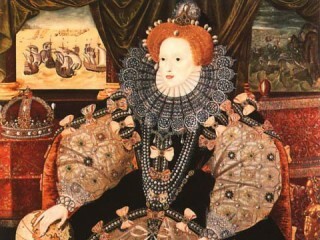 View the full website biography of Queen Elizabeth I.